Fructose 6-phosphate (sometimes called the Neuberg ester) is a derivative of fructose, which has been phosphorylated at the 6-hydroxy group. It is one of several possible fructosephosphates. The β-D-form of this compound is very common in cells. The great majority of glucose and fructose is converted to fructose 6-phosphate upon entering a cell. The name Neuberg ester comes from the German biochemist Carl Neuberg. In 1918, he found that the compound (later identified as fructose 6-phosphate) was beproduced by mild acid hydrolysis of fructose 2,6-bisphosphate. Fructose 6-phosphate lies within the glycolysis metabolic pathway and is produced by isomerisation of glucose 6-phosphate. It is in turn further phosphorylated to fructose-1,6-bisphosphate. Compound C00668 at KEGG Pathway Database. Enzyme 5.3.1.9 at KEGG Pathway Database. Compound C05345 at KEGG Pathway Database. Enzyme 2.7.1.11 at KEGG Pathway Database. Enzyme 3.1.3.11 at KEGG Pathway Database. Reaction  at KEGG Pathway Database. Compound C05378 at KEGG Pathway Database. 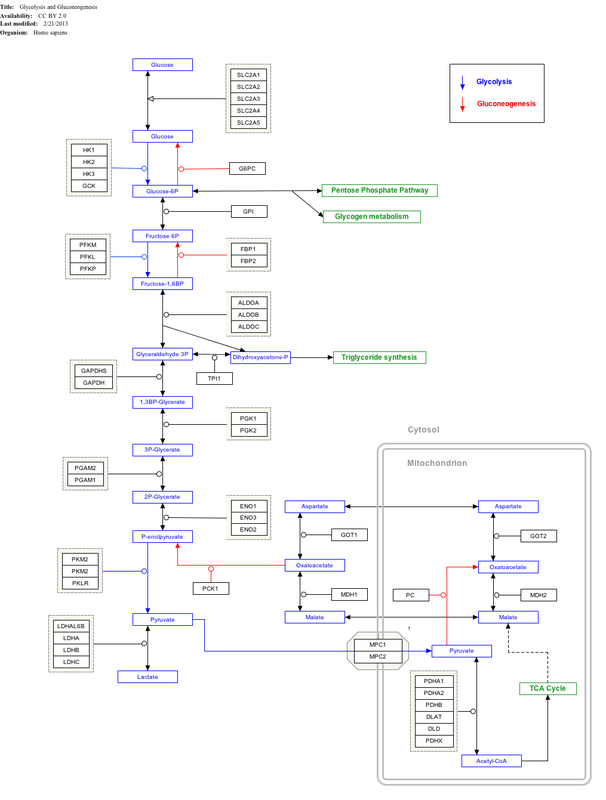 ^ The interactive pathway map can be edited at WikiPathways: "GlycolysisGluconeogenesis_WP534". ^ Berg, Jeremy M.; Tymoczko, Stryer (2002). Biochemistry (5th ed.). New York: W.H. Freeman and Company. ISBN 0-7167-3051-0. ^ Nelson, D. L.; Cox, M. M. "Lehninger, Principles of Biochemistry" 3rd Ed. Worth Publishing: New York, 2000. ISBN 1-57259-153-6.